StarMessage is a serene Windows screensaver. It has a lite (free) edition that you can download without registration, without any obligation. Below you can see the screenshots of this screensaver so you know what to expect. You can also see here a full description of StarMessage's many features, or read the user testimonials/reviews. If you have Windows 10, read here where the Windows 10 screensavers have gone so you can arrive at this screen. For Windows 7, it is easier to arrive to the screensaver settings screen. For previous versions of Windows, follow these instructions to arrive at the screensaver settings and selection screen. 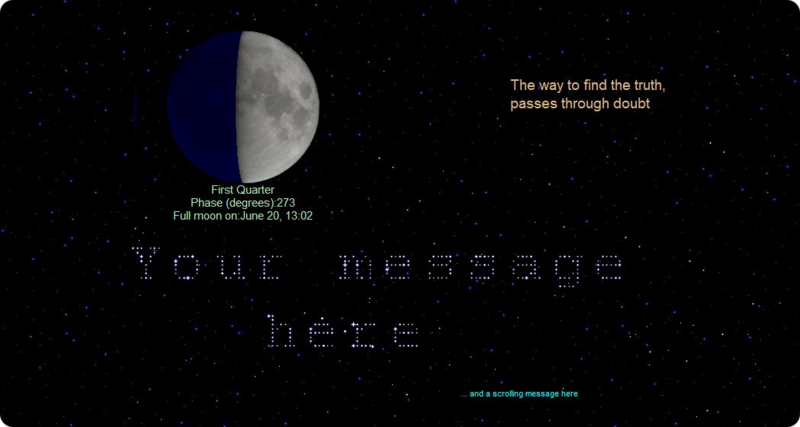 With StarMessage, you can write messages in the stars. Write your wishes, your love messages, leave messages for your child to see. Your imagination has the sky as its canvas. You can use StarMessage as a Digital Clock screensaver. You can easily delay Windows from entering sleep mode (e.g. while you are doing a big file download).